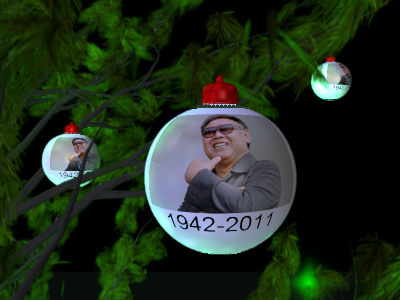 First, we have to celebrate the death of North Korean dictator Kim Jong Il. The longtime communist leader died of a massive heart attack last weekend. He was 69. We’re talking about his age, folks, not the position in which he was found. With his death comes a frightening uncertainty around the world about the direction of North Korea and it’s nuclear weapons program. How this is a different uncertainty than when Kim Jong Il was alive, I don’t know. To refer to his death as a “celebratory” event is fair, considering the tyranny of his 17-year reign. I suppose we can compare his death to that of Paris Hilton (when she finally does the world a favor in some sleezy motel room with a nightstand littered with pill bottles and Early Times bourbon). The Pentagon officially called it a war in Iraq, pulling all U.S troops out of that country after 105 months of occupation. For you public school attendees, that’s eight years and nine months. Model Lauren Scruggs is recovering nicely after a freak accident involving an airplane in Texas, in which she literally walked into a rotating propeller. Scruggs was severely injured, losing her left hand, left eye and requiring several reconstructive surgeries to repair the left side of her face. Doctors say she took a few steps in her hospital room in Dallas. I don’t know, but wasn’t it “a few steps” that got her into this situation. Clearly, she’ll be moving from the right side to the left side on the “before and after” ads. A coworker of mine is recovering this week following leg surgery. A plowing accident and the subsequent operation left her left leg six inches shorter than the other. I’m happy to report she is almost 100% back to normal. She always could run circles around me. There is more good news to report from the local level, specifically Indianapolis, where a nine-year-old boy with autism (not an “autistic boy,” however, as not to label him) was found wandering the streets with no shoes on a mile from his home several hours after his mother reported him missing. It was later learned that he was just doing math and was in no danger. Child protective services allowed the boy to be returned to his mother after it was determined she was just passed out after a marathon night of drinking and Xanax and wasn’t abusive in any way (at least the child wasn’t talking about it). Congratulations are in order for both the Indianapolis Colts and the Green Bay Packers, who both snapped 13-game streaks Sunday afternoon. The Colts can finally stop worrying about becoming only the second team in NFL history to go 0-16 in a season. They beat division rival Tennessee at home. No one is happier than quarterback Dan Orlovsky, who worked extra hard to avoid his 2nd winless season (2008 Detroit Lions – yes, that hurts this Detroit native to say that). The good news is now the Colts can focus on getting back to business – losing games without Peyton Manning. Meanwhile, the Packers can stop thinking about an undefeated season, getting man-handled by the Chiefs and the world’s best quarterback Kyle Orton. On to the NFC championship game against the Lions. And that’s a quick look at the good news on this week before Christmas. Don’t forget, if you have any good news you’d love to share, there’s always another side which is often not reported in mainstream media. Happy holidays and here’s to a great 2012 ahead!